The hero’s journey is a search for one’s soul and is chronicled in mythologies and fairy tales throughout the world. This quest motif does not, however, address the archetypal journey of the heroine. For contemporary women, this involves the healing of the wounding of the feminine that exists deep within her and the culture. 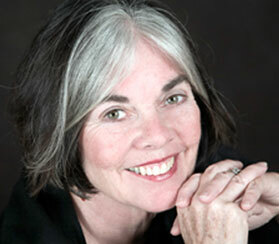 In 1990, Maureen Murdock wrote The Heroine’s Journey: Woman’s Quest for Wholeness as a response to Joseph Campbell’s model. Murdock, a student of Campbell’s work, felt his model failed to address the specific psycho-spiritual journey of contemporary women. She developed a model describing the cyclical nature of the female experience. Campbell’s response to her model was, “Women don’t need to make the journey. In the whole mythological tradition the woman is there. All she has to do is to realize that she’s the place that people are trying to get to” (Campbell, 1981). That may be true mythologically as the hero or heroine seeks illumination but psychologically, the journey of the contemporary heroine involves different stages. The Heroine’s Journey begins with an Initial Separation from feminine values, seeking recognition and success in a patriarchal culture, experiencing spiritual death, and turning inward to reclaim the power and spirit of the sacred feminine. The final stages involve an acknowledgement of the union and power of one’s dual nature for the benefit of all humankind (Murdock, 1990, pp. 4-11). Drawing upon cultural myths, Murdock illustrates an alternative journey model to that of patriarchal hegemony. It has become a template for novelists and screenwriters, shining a light on twentieth-century feminist literature. The Heroine’s Journey is based on the experience of fathers’ daughters who have idealized, identified with, and allied themselves closely with their fathers or the dominant masculine culture. This comes at the cost of devaluing their personal mothers and denigrating values of the female culture. This occurs for both men and women if not on a personal level, then certainly on a collective level. If the feminine is seen as negative, powerless or manipulative the child may reject those qualities she associates with the feminine, including positive qualities such as nurturing, intuition, emotional expressiveness, creativity and spirituality. On a cultural level, the Separation from the Feminine results from a reaction to images of the feminine presented by the media that are impossible to identify with or because of a lack of feminine imagery in religion. Gods and goddesses are often seen as diverse ways of being in the world and the ancient goddess Athena symbolizes the second stage of the Heroine’s Journey. This Greek goddess of civilization sprang full grown from the head of her father, Zeus. Her mother Metis had been swallowed whole by Zeus, thus depriving Athena of a relationship with her mother. This stage involves an Identification with the Masculine, but not one’s inner personal masculinity. Rather, it is the outer patriarchal masculine whose driving force is power. An individual in a patriarchal society is driven to seek control over themselves and others in an inhuman desire for perfection. The young girl may see men and the male world as adult and becomes identified with her inner masculine voice, whether that is the voice of her father, god the father, the professional establishment, or the church. Unfortunately, masculine consciousness often tries to help the feminine to speak; it jumps in, interrupts, and takes over, not waiting for her body to know its truth. The next stage, like the hero’s journey, is the Road of Trials where the focus is on the tasks necessary for ego development. In the outer world, the heroine goes through the same hoops as the hero to achieve success. Everything is geared to climbing the academic or corporate ladder, achieving prestige, position and financial equity, and feeling powerful in the world. However, in the inner world, her task involves overcoming the myths of dependency, female inferiority or deficit thinking, and romantic love. Many females have been encouraged to be dependent, to disregard their needs for another’s love, to protect another from their success and autonomy. We live in a society dominated by a masculine perspective where the feminine is perceived as less than the masculine. The Mother Tongue, the language of experience and body knowing is not seen as valid as the Father tongue, the language of analysis. In some families, cultures and religions, being born in a female body is second rate; the female child has therefore failed from the beginning and is marked psychologically as inferior solely because of her gender. In this century the foremost moral issue, from third world countries to the leading world powers, is the abuse and oppression of women and girls around the globe. The myth of romantic love is that the other will complete her life whether the other is a husband, lover, son, ideology, political party or spiritual sect. The attitude here is that the “other” will actualize her destiny. This stage is symbolized by the myth of Eros and Psyche. The first part of the heroine’s journey is propelled by the mind and the second part is in response to the heart. The heroine has been working on the developmental tasks necessary to be an adult, to individuate from her parents, and to establish her identity in the outer world. However, even though she has achieved her hard-earned goals, she may experience a sense of Spiritual Aridity. Her river of creativity has dried up and she begins to ask, “What have I lost in this heroic quest?” She has achieved everything she set out to do, but it has come at great sacrifice to her soul. Her relationship with her inner world is estranged. She feels oppressed but doesn’t understand the source of her victimization. “It takes a strong ego to hold the darkness, wait, hold the tension, waiting for we know not what. But if we can hold long enough, a tiny light is conceived in the dark unconscious, and if we can wait and hold, in its own time it will be born in its full radiance. The ego then has to be loving enough to receive the gift and nourish it with the best food that new life may eventually transform the whole personality” (p. 115). At this point, the heroine is faced with a Descent or dark night of the soul, a time of major de-structuring and dismemberment. A descent brings sadness, grief, a feeling of being unfocused and undirected. What usually throws a person into a descent is leaving home, separating from one’s parents, the death of a child, lover or spouse, the loss of identity with a particular role, a serious physical or mental illness, an addiction, the midlife transition, divorce, aging, or loss of community. The descent may take weeks, month, years, and cannot be rushed because the heroine is reclaiming not only parts of herself, but also the lost soul of the culture. The task here is to reclaim the discarded parts of the self that were split off in the original separation from the feminine–– parts that have been ignored, devalued, and repressed, words and feelings swallowed in her quest for success. Dismemberment and renewal is a key feature of the ancient Sumerian myth of Inanna and Ereshkigal. Inanna, the Queen of the Great Above, journeys to the Underworld to be with her sister Ereshkigal, the Queen of the Great Below. Ereshkigal’s consort has died and Inanna traverses seven thresholds and seven gates to be with her sister in her grief. At each gate she divests herself of symbols of her power. When she reaches the Underworld, Ereshkigal fixes her with the eye of death and hangs her on a peg to rot. Inanna sacrifices herself for the earth’s need for life and renewal. Her death and subsequent return to life predates Jesus Christ’s crucifixion and resurrection by three thousand years. At this stage in the heroine’s journey, a woman seeks to reclaim a connection with the sacred feminine to better understand her own psyche. She may become involved in research about ancient goddess figures such as Inanna, Ereshkigal, Demeter, Persephone, Kali, or the Marian mysteries. There is an Urgent Yearning to reconnect with the Feminine and to heal the mother/daughter split that occurred with the initial rejection of the feminine. This may or may not involve a healing with one’s personal mother or daughter, but it usually involves grieving the separation from the feminine and reclaiming a connection to body wisdom, intuition and creativity. The next stage involves Healing the Unrelated or Wounded Aspects of her Masculine Nature as the heroine takes back her negative projections on the men in her life. This involves identifying the parts of herself that have ignored her health and feelings, refused to accept her limits, told her to tough it out, and never let her rest. It also involves becoming aware of the positive aspects of her masculine nature that supports her desire to bring her images into fruition, helps her to speak her truth and own her authority. The final stage of The Heroine’s Journey is the Sacred Marriage of the Masculine and Feminine, the hieros gamos. A woman remembers her true nature and accepts herself as she is, integrating both aspects of her nature. It is a moment of recognition, a kind of remembering of that which somewhere at the bottom she has always known. The current problems are not solved, the conflicts remain, but one’s suffering, as long as she does not evade it, will lead to a new life. In developing a new feminine consciousness, she has to have an equally strong masculine consciousness to get her voice out into the world. The union of masculine and feminine involves recognizing wounds, blessing them, and letting them go. The heroine must become a spiritual warrior. This demands that she learn the delicate art of balance and have the patience for the slow, subtle integration of the feminine and masculine aspects of her nature. She first hungers to lose her feminine self and merge with the masculine, and once she has done this, she begins to realize this is neither the answer nor the objective. She must not discard nor give up what she has learned throughout her heroic quest, but view her hard-earned skills and successes not so much as the goal but as one part of the entire journey. This focus on integration and the resulting awareness of interdependence is necessary for each of us at this time as we work together to preserve the health and balance of life on earth (Murdock, 1990, p.11). “Remember, as different as we are, you and I, we are of one spirit. As dissimilar as we are, you and I, we are of equal worth. As unlike as you and I are, there must always be solidarity between the two of us. Unlike each other as you and I are, there can be no harmony in the universe as long as there is no harmony between us” (Zolbrod,1984, p. 275). Campbell, J. (1949). The hero with a thousand faces. Princeton, NJ: Princeton UP. Campbell, J. interview with author, New York, 15 September 1981. Murdock, M. (1998). The heroine’s journey workbook. Boston: Shambhala Pub. Murdock, M. (1990). 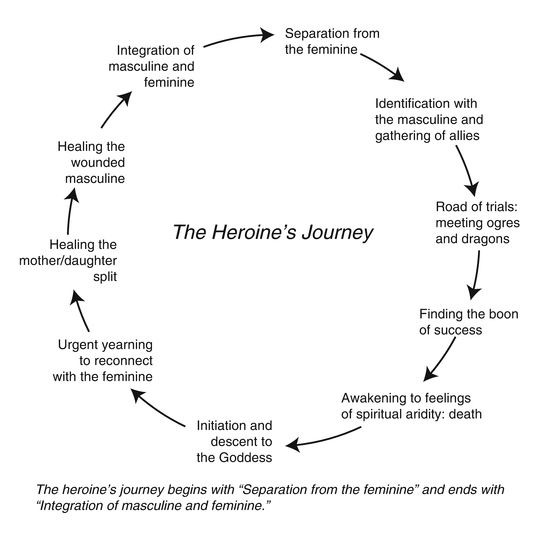 The heroine’s journey: Woman’s quest for wholeness. Boston: Shambhala Pub. Woodman, M. (1992). Leaving my father’s house: A journey to conscious femininity. Boston: Shambhala Pub. Zolbrod, P. G. (1984). Dine bahane: The Navaho creation story. Albuquerque: U of New Mexico P.